Carlsbadistan are you ready to rawk and roll, and swing out to some southern blues? Then the Museum of Making Music has just the show for you on Friday night, April 5, 2013 as The Tilt kicks it up a notch at MOMMs Local Flavor Concert Series. The Tilt band is creating new music and original songs with a fresh new sound of organic Rock and Blues. They are a youthful but experienced band fronted by singer Jesse Malley and guitarist Jeff Irwin. The Tilt delivers live as well as in the studio and continues to maintain a do-it-yourself approach to writing, recording, and releasing original songs. Their debut album is set for early 2013. Tickets are $10 and include a slice of Flippin’ Pizza and a beverage from the Stone Brewing Company. Nothing wrong with that at all. The Museum of Making Music is located at 5790 Armada Drive in Carlsbad, California. The New Village Arts Theatre has chosen Saturday, June 22, 2013 for their annual gala fundraiser. 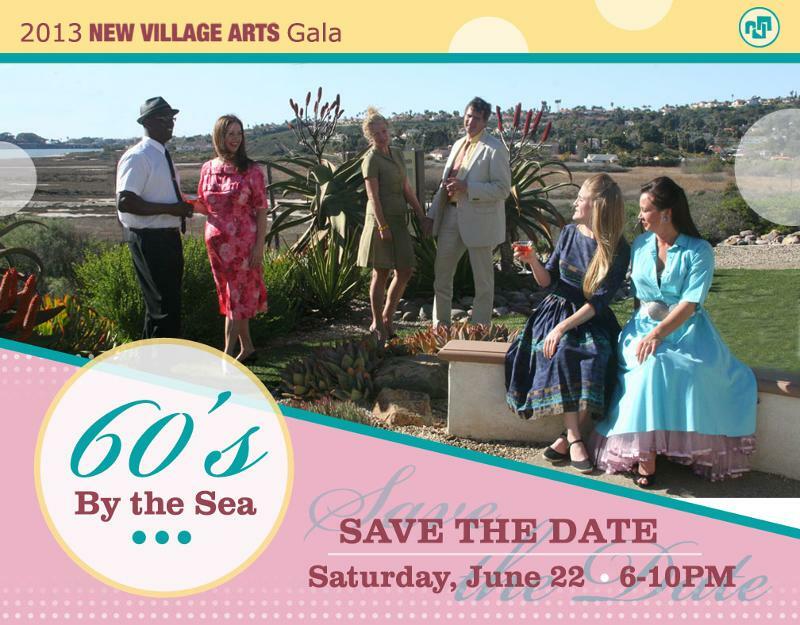 This year’s theme will be 60’s By The Sea: Celebrating Carlsbad In The 1960. This year’s Gala is a celebration of Carlsbad culture in the 1960s, set against the backdrop of sunset over the gorgeous Agua Hedionda Lagoon. Besides dinner at the Lagoon Discovery Center, you will also have the opportunity to take home the best offerings of America’s finest city by bidding on our various silent and live auction items. Carlsbad doesn’t get any cooler than this. We look forward to seeing you there! Tickets will be $280 per couple until April 12. Just use the code “PARTY” at check out. For more information, click the link. 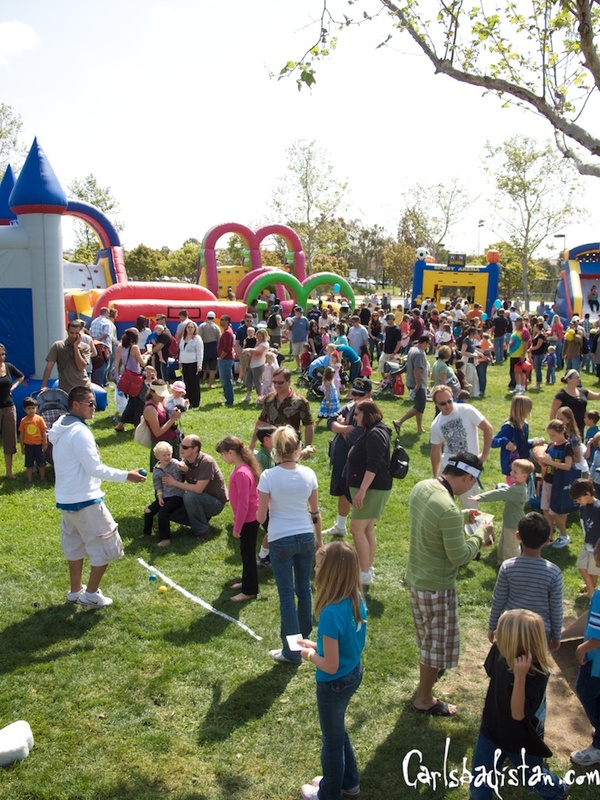 On Saturday, March 30, 2013 the City of Carlsbadistan is presenting its EGGstravaganza Spring Festival at Poinsettia Park. The event features an ongoing “egg scramble” of multiple egg hunts from 10:30 a.m. until 12:30 p.m., separated by age, so come when it’s convenient for you. While you’re there, you’ll also enjoy a family scavenger hunt, a sampling of Parks & Recreation Department summer camps, photos with the Easter bunny and a fun zone with bounce houses, a giant slide and a chance to “soak the bunny.” . . To keep the scramble fun for all ages, one field will be set up for those ages 6 and over who want to race for their eggs and an identical one will be set up for children 5 and under, while a third field will have piles of eggs set aside for younger children, babies or those with special needs to collect at their leisure. Hey, Carlsbadistan! 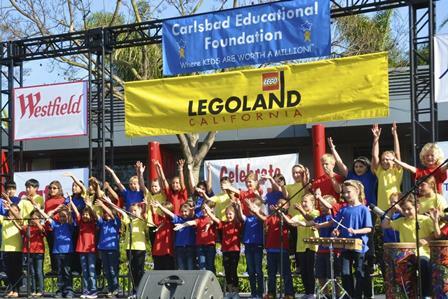 Did you know that you can Celebrate Carlsbad Day at Legoland Callifornia for only $20 on April 27, 2013? Did you know that by doing this you’ll also help the Carlsbad Education Foundation a little? Oh, but don’t think you’re going to “spend the day at Legoland.” Nope. As usual, Legoland says the Celebrate Carlsbad Day tickets are only good from 1 PM to 8 PM. That’s right, the turnstiles open at 9 AM, but Celebrate Carlsbad Day ticket holders won’t get in until 1 PM. And what’s more, only “a portion of the proceeds” from these special ticket sales actually goes to the Carlsbad Education Foundation. So hey, use this as an opportunity to visit Legoland at a moderately affordable price, but don’t think Legoland is doing any huge favors because it really is the least they could do. The Neverly Brothers will take New Village Arts Theatre audiences through a guided musical tour through rock ‘n’ roll history on April 22, 2013 as they present their Retro-Rock Revue. 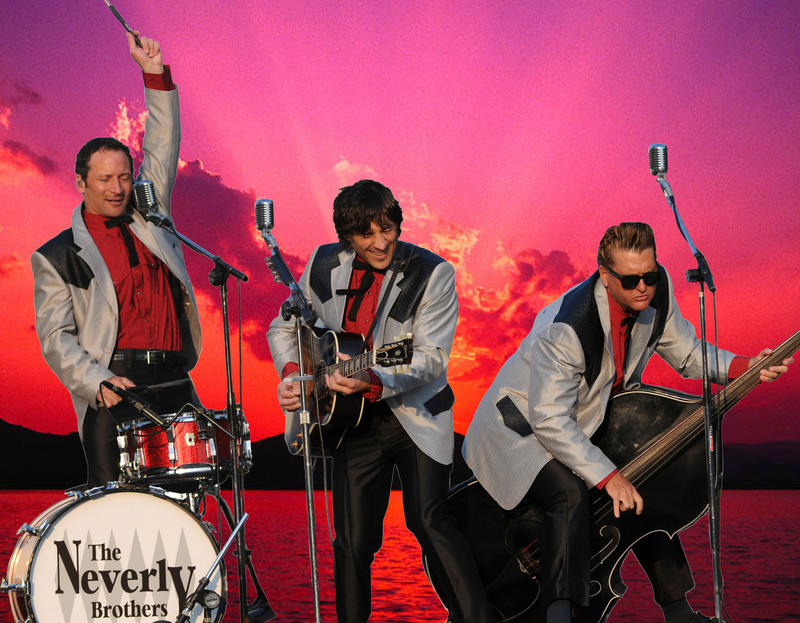 The Neverly Brothers play all your favorite hits from 1950s American Rockabilly, Rock n’ Roll and Rhythm & Blues pioneers up through the 1964 British Invasion groups in an awe inspiring concert that will have you singing, dancing and thoroughly entertained. Dressed in period-perfect matching suits from each era, and playing show-stopping renditions of all the classics, these rockers have a look and a sound that will make you feel like you are witnessing rock history unfold before your very eyes and ears. Ready to rock out? The show starts at 7:30 PM on April 22, 2013. Tickets are $25 to $35. 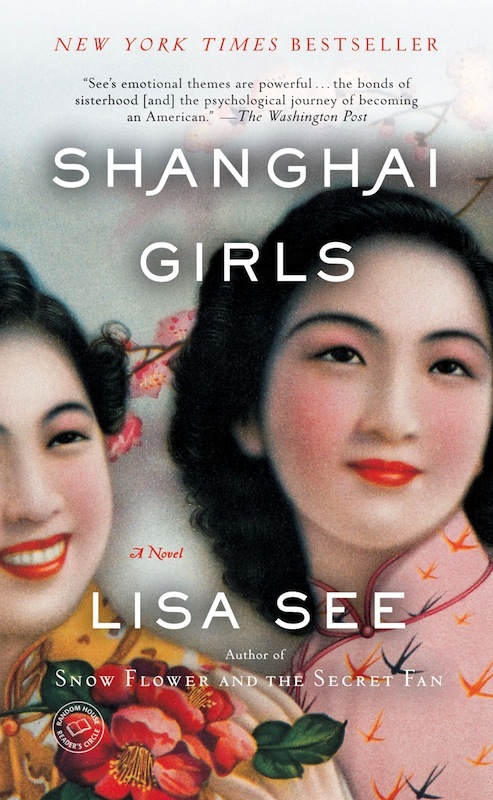 Click here to buy tickets. The Foundry Studios, the art gallery portion of the New Village Arts Theatre is presenting an art show titled Inside The Cuckoo’s Nest in the lobby at New Village Arts Theatre, Saturday, March 30 through Sunday, April 21. 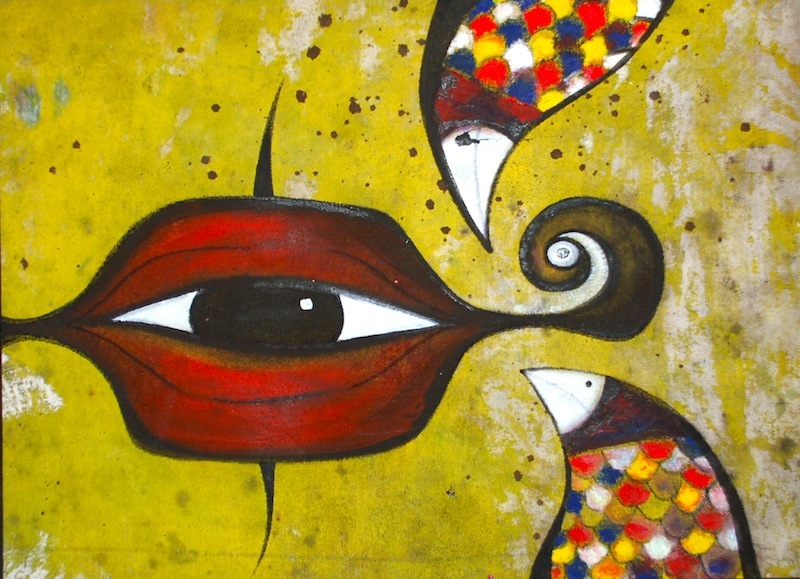 The resident artists at THE FOUNDRY STUDIOS present art themed to the new play at New Village Arts Theatre, One Flew Over the Cuckoo’s Nest, an epic American classic that fights for the freedom of the human mind. Brawler Randle P. McMurphy feigns insanity to serve out his prison sentence at a mental institution controlled by Nurse Ratched, who dominates with a kind of violence that McMurphy can’t fight with his fists. The battle for control of the ward pushes rivals to the breaking point. Earlier this week, The Full Pint was tipped off by The Carlsbad Patch that a restaurant called Catch Carlsbad would be rebranding into 38º Carlsbad. Crazier than those string of words, was the fact that the publication Carlsbad Patch assumed that this was an expansion of Clay Harding’s craft beer bar, 38 Degrees Ale House and Grill in Alhambra, CA. . . After Carlsbad Patch was informed there was no affiliation between the two restaurants, we reached out to both Clay Harding of 38 Degrees and Mayur Pavagadhi, the gentleman turning his seafood restaurant into a craft beer restaurant called 38º Carlsbad. Mayur owns other restaurants in the area under the name Paon Carlsbad LLC. Pavagadh was quoted as saying that he didn’t think there was a problem with the name of his restaurant. According to a second post on The Full Pint, 38 Degrees Ale House and Grill sent several cease and desist letters to Pavagadh’s lawyer with no response. Now, however, it appears that Pavagadh has swapped the numbers on his restaurant and renamed it 83 Degrees Carlsbad. Those who know will remember that a similar last minute name change occurred at Pavagadh’s Paon restaurant just before it opened. That restaurant’s original name Per Se was already taken by a restauranteur named Thomas Keller. What was it they say about the best form of flattery? 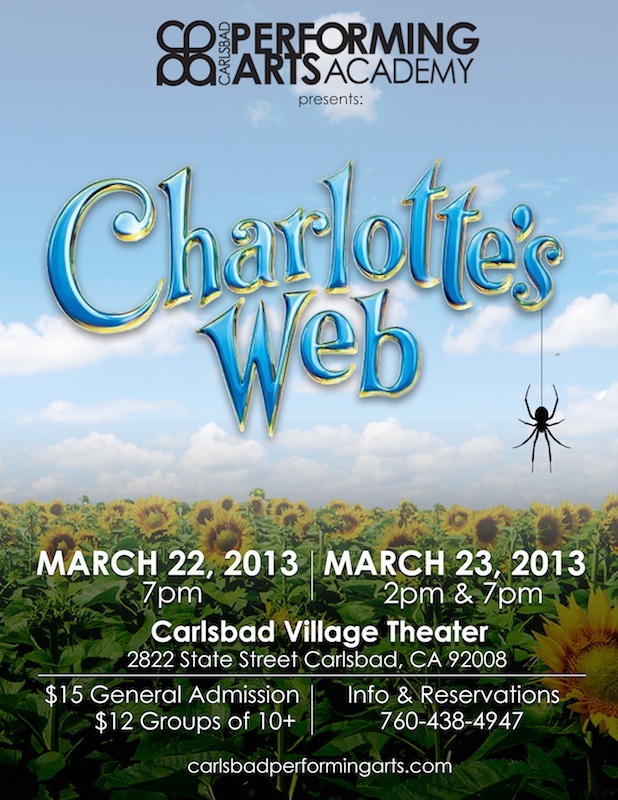 The Carlsbad Performing Arts Academy is proud to present Charlotte’s Web The Musical March 22, 2013 at 7 PM and March 23, 2013 @ 2 PM and 7 PM at Carlsbad Village Theatre. We have 25 talented kids ages 7-16 performing in this fun musical stage adaptation based on the children’s novel written by E.B. White. A wonderful event for the whole family! 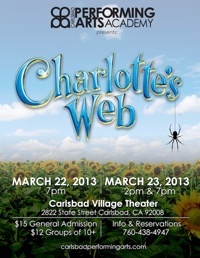 Charlotte’s Web tells the heartwarming story of a pig who befriends a spider. The Carlsbad Village Theatre is located at 2822 State Street in Carlsbad. Tickets for the shows are $15 General Admission or $12 for groups of 10 plus. For more information or to make reservations please call. 760-438-4947.